Vegans are Not Annoying: Here are 10 Reasons Why. Traffic jams: annoying. A sudden rain shower when you just left the hair salon and have no umbrella: annoying. Chatty talkers when you are trying to relax at a spa: annoying. The takeout delivery guy forgetting something in your order: annoying. Loving animals, saving the planet, enjoying yummy vegan food: not annoying. Vegans are Not Annoying: Here are 10 Reasons Why. So, why this post instead of a recipe today? Today I listened to this awesome interview on NPR about how a new breed of boys, including two of my faves, Joshua Katcher and Dominick Thompson, are claiming their masculinity by embracing veganism. After I listened to the audio, I started reading the webpage comments and was shocked to read such negative replies after such a rockstar, easy-going interview .. and on NPR. I would expect as much on say, BuzzFeed or even YouTube. But NPR? One of the oddest comments was how someone insisted that vegans are annoying. Why? Well his google search suggestions confirmed it for him. Well OK then. I was so mind-boggled that people are STILL so discriminatory towards vegans, calling them (me) annoying, that I decided to comment back here on my blog. Hi, my name is Kathy. I am vegan. And my friends and family will vouch for me, I am not annoying. Annoying is a tricky word to use to describe an entire group of people. Because "to annoy" someone is really a relative feeling. What annoys me may not annoy you. 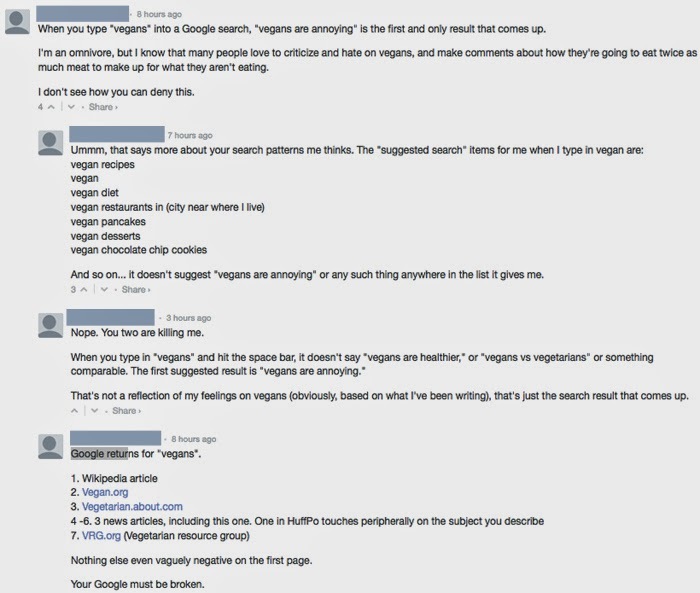 But without specifics, and without using singular cases or people to describe an entire community (because you find some annoying people in every group) lets take a big picture look at veganism so that I can lay down to truth, hopefully once and for all: on average vegans are not annoying. But before you delve into this post, maybe check out my 5 reasons for why I am vegan so you can understand the why of this story. 1. We are Nice. Vegans care an extra special amount for animals. They care. They have emotions. They are responsive to the pain of others. Animals and (in most cases I have seen) humans too. So give them a big glossy, sunshine white smile because they will most likely return the grin and give you a friendly nod. Nice people should not annoy you. 2. We Bring You Food. We are often offering to bring you food. Seriously. We will bake you cookies, make you appetizers for parties, share our recipes and make you cupcakes on your birthday that you will swear were "just like your mom used to make." Vegans LOVE to share vegan recipes and so if you want us to make you food, just ask. We know that the BEST form of unobtrusive/non-annoying advertising for the vegan lifestyle is to get people to try the yumminess. Example: My non-vegan friends are always asking me to bring some vegan goodies to parties, both so I will have stuff to eat (just in case) and also so they can try out the food and taste what all the vegan buzz is about. Free food = not annoying. 3. We Were Probably Just Like You. I used to dunk my McDonald's chicken nuggets in barbecue sauce and honey. I used to eat pork chops (well maybe one bite until I cried to my mom). I used to slather A1 sauce on my steak. I used to smother my baked potato in dairy sour cream. I used to break eggs for my omelets and gobble down slices of dairy cheese pizza. I used to be just like you. I respect the old me and the new me. Obviously after living in both worlds, I choose the vegan me. But that also means that I respect you, whatever you eat. I know that non-vegans can take 180 turns and suddenly want to go vegan. I know that your view of food can change in an instant or morph slowly over time. I know all this. I was you. Now I am me. So just remember, when you think I do not know "how amazing!!" bacon tastes. I do. And I do not miss it for even a second. 4. We are Cool. I hate to have to go here, but it is true. Veganism is trendy. And in the superficial part of life, being on top of trends and knowing what is "hot" can help with your coolness appeal. And in case you have missed the boat, a giant, huge amount of "cool" celebrities and people are either going vegan, trying vegan, secretly leaning towards "vegan-ish" or are 100% waving their vegan flag. Warning, name dropping alert here. For starters, JLo recently went plant-based. No matter what her reasons, she did it. And looks amazing. Same for vegan-ish Beyonce and JayZ. More dedicated plant-based eaters include James Cameron, Toby Maguire, the coolest girl in school a la Clueless fame Alicia Silverstone, Ireland Baldwin (she was trying to be vegan and follows FindingVegan.com on Twitter), Carrie Underwood, Ellen Degeneres, Jared Leto, Rooney Mara, Moby, Jessica Chastain, Joaquin Phoenix, Casey Affleck, Bill Clinton = veganish (as are many celebs) and more and more and more. Coolness smashes annoyingness in the social game of life. If you are standing next to Jared Leto and Carrie Underwood at a party and thinking "OMG these two! How annoying." You best be re-evaluating life. 5. We Get It. Lets get real folks. You know what? We get it. You like to eat meat and eggs and cheese. That is fine. I actually do respect that and I do not think I am better than you. I understand that being 100% vegan is not for everyone. Yes, most vegans totally wish with our shiny pink hearts that everyone was vegan, but we know that is not the case. Most of us love you just the way you are and will not judge you for your meat-eating ways. Though, when asked, we will go into long rants and lengthy explanations as to why we think you should at least try veganism, or eat more vegan versions of your favorite meals. But again, WE GET IT, most of us do not rant unless specifically asked. Do not ask and expect us to be shy. We get the differences between you and me and we respect them. 6. We Have Non-Vegan Friends and Family. No, vegans are not born in a vegan bubble. Most vegans I know nowadays were brought up in non-vegan households with meat eating parents and siblings and hang around plenty of non-vegan friends. We are not in our own little vegan worlds, Although yes we are a very friendly bunch so we make vegan friends easily, and love swapping salad and vegan cupcake recipes with our vegan buddies. But I love my non-vegan friends and family just as much as my vegan friends and family. No bubbles here, we live in the same world, and deal with the same annoying sh*t in life. We are actually on the same team. The team of life. Lets share in life's REAL annoyances together. 7. We are Actually Really Amazing at Restaurants. If you think "you cannot take vegans anywhere," think again. I am actually a freaking PRO at dining out at ANY restaurant. I have ordered vegan meals at steak houses. I can veganize menu items in a flash, like a swift unicorn. I know every specific question to ask the waiter to make sure my order is plant-based, and I do it all with a quiet voice that I promise you won't even be able to hear on the other side of the table. I am basically just like someone with a food allergy, or gluten intolerance. I take a bit more love and care, but after the ordering is done I am just like you. And no, you do not even have to ever ask me this question: "Did you find something you can eat??" Yes, yes I did. And if the restaurant is not easy to customize, I will be happy with whatever I eat because you know us vegans, we are a happy bunch. And I can totally make myself something amazing when I get home. I chose this lifestyle, and eating light at one meal is no big deal to me, I just love hanging out with YOU. And if you are grabbing the bill, guess what, the "veg" option is usually the cheapest thing on the menu. Winner. And ps: There are some mind-blowingly delicious vegan restaurants out there, so take a chance and come dine with me. I'm talking about you, Pure Food & Wine, Real Food Daily, Gracias Madre, Veggie Grill, Native Foods, M Cafe, Blossom, Babycakes, Flore and on and on. So seriously, chill out at the table, I totally have my meal plans covered. 8. We Do Not Shout Things at You. You know those shout-y protesting vegans? I am sorry if they annoy you, but get over it. I know some of them and they are actually really cool people. Like amazing, in fact. I love them for sticking up for animals in a loud way. But I also realize that shouting, no matter what you are protesting, is going to have to possibility of being annoying to some. In the words of Elsa, let it go. There are ALL sorts of shouters and activists out there, many of whom are not vegan. Sometimes people need to scream, even non-vegans, and that's ok. There is all sorts of noise in this world, it shouldn't bother you if you have an inner calm in your soul. And ps. most vegans are not even the shout-y type. We have strong values for why we do not use animal products, but if you do not want to hear it, most of us will let you chomp on your meat in peace. And although sometimes all I want to do is shout and scream and cry and SHOUT about how much it saddens me that animals are treated so inhumanely. But I know that once people start shouting, most people stop listening. So when asked, I will carefully, respectfully, passionately discuss with you why veganism is something that I am proud of and adore in my life. But no, I do not shout at you. 10. We Can Take a Punch without Unleashing Drama. Vegans know how to take punches with grace. Go on, insult us. Make fun of our rabbit food diets. Tell us we look like Olive Oil and need to eat some protein, aka a big fat juicy beef burger. Because we all know plants have ZERO protein. (Wait, tempeh has 24g of protein, lentils have 18g per serving??? No way.) Tell us we look anemic. Tell us we are weak and wimpy and in need of nutrition, all while we run marathons, power through our days and explore the big beautiful world in front of us. Tell us that you have no idea where we get our protein, what we eat when we are traveling and how in the world we survive without REAL ice cream, all while we spoon-lick our creamy full-fat coconut milk ice cream. Tell us we are "the vegan" in the room, and greet us with a chuckle by saying, "Oh you are THE VEGAN." Tell us we are SO sad for not being able to eat bacon and hot dogs and cheese. Tell us we really are not helping the world because we feed our cats meat. And that plants have feelings too. And do we know how many bugs are killed in the farming of spinach? Tell us we are annoying. A million times, say it. I promise you, we have heard worse. We have experienced meaner glances and dirtier looks in our days. Whispers and groans, fake smiles and glances. We have heard it all. And beyond. But through it all, through all the bullying and strife we STAY VEGAN. Why in the hell do we do it? Why do we allow ourselves to be bashed so much? We stick it out. Through the punches. Because this vegan thing is pretty darn cool. Pretty darn amazing. And totally life-changing. If annoying means, proud, happy, blissful, enthusiastic, animal-loving, Earth-loving, people-loving, sharing, food-generous, analytical, empathetic, passionate and understanding ... well maybe you should google "annoying." Wait, I will do it for you.. ..So, "annoying" is really all relative, isn't it? What annoys me may not annoy you. So if kind, cool, progressive, animal and Earth lovers annoy you, maybe you should take a look at YOU before judging me. 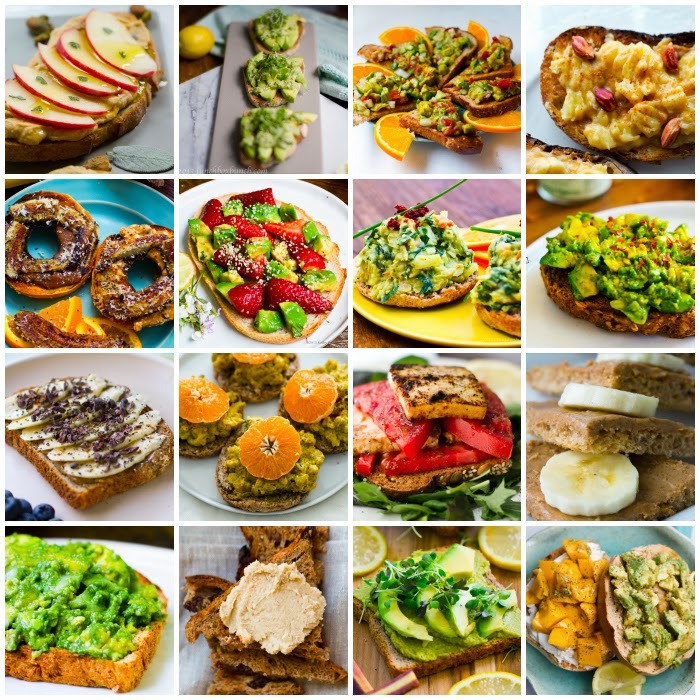 Or just gawk at 18 vegan toast recipes, because that really should get your mind off all of this..